A joint research team led by Dr. Masuo Nakano, Department of Seamless Environmental Prediction Research (DSEP) at Japan Agency for Marine-Earth Science and Technology (JAMSTEC: Asahiko Taira, President) and Prof. Masaki Satoh, Atmosphere and Ocean Research Institute at The University of Tokyo demonstrated that it is possible to predict tropical cyclogenesis about two weeks in advance. It is based on simulations of eight tropical cyclones in August 2004 by applying a Nonhydrostatic ICosahedral Atmospheric Model (NICAM)*1 on K computer*2. 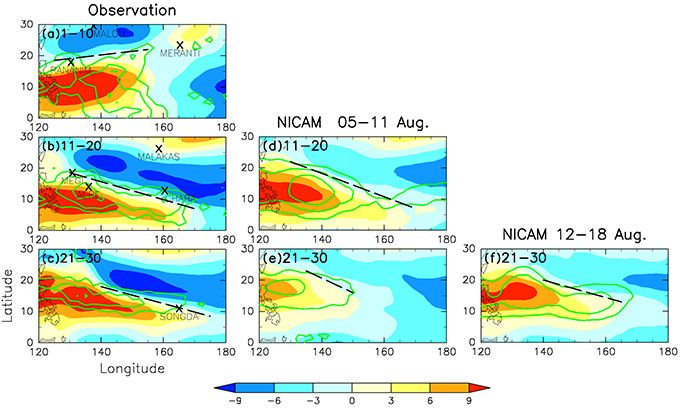 In addition, a detailed analysis of atmospheric circulation fields found eastward extension of monsoon trough*3 over large areas in the central Pacific when 18th Typhoon of the year (named as Songda) occurred on August 28, 2004. The NICAM simulations successful caught this extension of monsoon trough two weeks before the genesis of 18th Typhoon with high accuracy. It is known that the extension scale of monsoon trough depends on atmospheric variations called boreal summer intraseasonal oscillation (BSISO)*4. Observation-data analysis has been pointed out the BSISO and tropical cyclogenesis are related each other. And, these study results demonstrated for the first time that a global cloud-system-resolving model NICAM is capable of predicting BSISO with high accuracy, which can also leads to highly accurate prediction of tropical cyclogenesis. It opens a door to successful prediction of tropical cyclogenesis. This research has been carried out as part of research projects "Study of extended-range predictability using global cloud system resolving Atmospheric Model" and "Prediction of global climate and environmental changes" (led by Masahide Kimoto, Project ID hp120313, hp130010)*5 for "Study on Prediction of Weather, Climate and Environment Toward Disaster Prevention/Mitigation (Field 3)" of HPCI Strategic Program supported by the Ministry of Education, Culture, Sports, Science and Technology(MEXT) . This study results have been posted on the U.S. online journal, Geophysical Research Letters on January 20, 2014 (JST: 02:00 pm, January 20, 2014). *1 NICAM (Nonhydrostatic Icosahedral Atmospheric Model): It is a highly complex atmospheric model, which is designed to represent detailed features of clouds on the Earth by explicitly calculating individual clouds on the globe. Conventional global atmospheric models require assumptions regarding the interaction between clouds and large-scale atmospheric circulations. The horizontal resolution applied for NICAM is mainly in the range of 870 m to 14 km. Global cloud resolving simulations apply 3.5 to 0.87 km resolution, and global cloud-system resolving simulations apply 14 and 7 km resolutions. *2 K computer ：Named for the Japanese word "kei," it is the first machine to achieve 10 quadrillion operations a second, ranked as the world's fastest supercomputer in 2011. It has been jointly developed by RIKEN and Fujitsu as a core system for the "construction of innovative high-performance computing infrastructure (HPCI)" program by MEXT. It is installed at the RIKEN Advanced Institute for Computational Science campus in Kobe. *3 Monsoon trough: A region of low atmospheric pressure at sea level, where monsoonal southwesterly and trade winds meet. A separating line between monsoon and trade winds is referred to as a shear line. 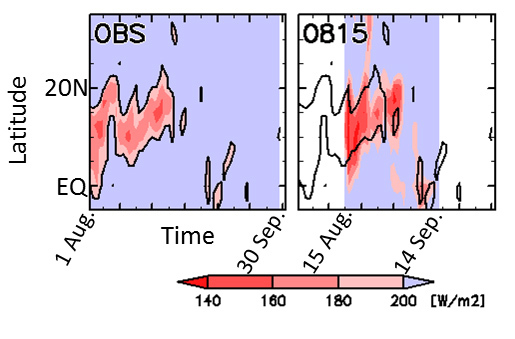 *4 Boreal Summer Intraseasonal Oscillation (BSISO): Atmospheric variability in which large cumulonimbus covering a distance of several thousand kilometers in the Indian Ocean and Northwest Pacific move toward the north on a 30-60 day cycle. It affects not only tropical cyclogenesis but also atmospheric pressure patterns in middle and high latitudes. Because of its impacts, it is required to predict it accurately. *5 "Study of extended-range predictability using global cloud system resolving Atmospheric Model" and "Prediction of global climate and environmental changes": These research projects have been carried out by JAMSTEC, The University of Tokyo, RIKEN, and also in collaboration with Japan Meteorological Agency. Table 1: Prediction rate (%) based on simulations. Simulations were carried out one week, two weeks and three weeks before tropical cyclogenesis (seven simulations for each; however, four simulations carried out one week before the 13th typhoon and five simulations two weeks before the 15th typhoon) and last three days before (three simulations). As clearly shown here, the 15th -18th typhoons of the year were successfully predicted with more than 40% starting from two weeks before the genesis. Figure 1: Left shows obsevation. Right shows time series of convective activity in the Philippine sea (120-150 east longitude) on simulation started on August 15. 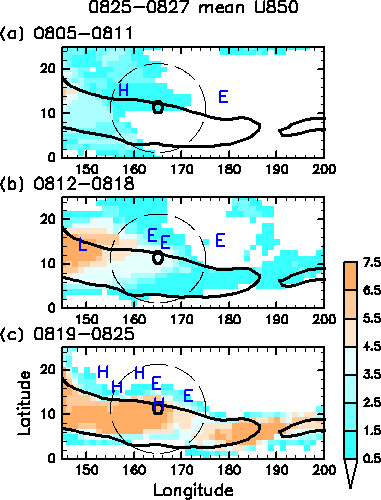 Figure 2: Zonal winds at 850hPa（1500m high）and location of typhoon genesis in early August (top), mid-August (middle) and late August (bottom). Dashed lines indicate shear lines. From left, each panel shows observation, averages of simulations started from between August 5 and 11 (three weeks before genesis of the 18th typhoon) and between August 12 and 18 (two weeks before genesis of the 18th typhoon). Figure 3: Results of simulations that predict 3-day (25–27 August 2004) mean westerly wind, initialized during: (a) 5–11 August; (b) 12–18 August; and (c) 19–25 August. The color shading indicates the number of experiments (out of seven) that successfully predict mean westerly wind. The black contour shows zonal wind speeds of zero derived from JRA-25. The black 'O' shows the observed genesis location of typhoon Songda and the black broken circles have radii of 10 degrees from these locations. The blue letters H, E, and L show the simulated genesis location of typhoon Songda, classified as hit, early-genesis, and late-genesis locations, respectively.